Franklin Machine Products has been producing equipment for the foodservice industry for over 100 years out of their Lumberton, New Jersey headquarters. The company offers a wide selection of products, all of which are designed to help foodservice establishments run smoothly, efficiently, and sanitarily. 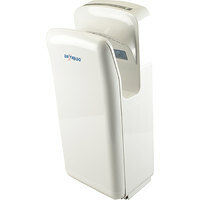 As a result, Franklin Machine Products started producing hand dryers, which are a safe and sanitary way for your employees and customers to dry their hands after washing them. Also make sure to check out other great items from American Dryer, Bobrick, Excel Dryer, Franklin Machine Products, Royal Industries, Stiebel Eltron and World Dryer. Franklin Machine Products hand dryers are innovative and high tech, and they use technology like UV light and infrared sensors to reduce the spread of bacteria. Due to their high-tech design and bacteria stopping power, these products are perfect for many different types of businesses, like restaurants, hotels, corporate offices, government buildings, and healthcare facilities. In addition to reducing the spread of germs, Franklin Machine Products hand dryers can help your business save money, because you won’t need to constantly stock up on paper towels. For more janitorial equipment, check out our canister vacuum cleaners, toilet paper dispensers, and pest control products. 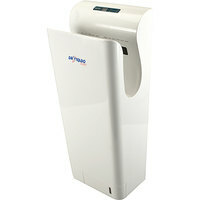 If you're wondering where to buy Franklin Machine Products hand dryers, we have a large selection of Franklin Machine Products hand dryers for sale at the lowest prices.